This topic provides information about the process guide framework for developers who are extending the warehouse mobile processes in X++. The warehouse mobile processes are extensible as a result of the processes being broken into small steps. The business logic and user interface building of each step has been extracted into individual classes, which allows for extensibility. The warehouse mobile execution flows are exposed through a single custom service endpoint. The request arrives from the mobile app in the form of an XML string, which contains the metadata of the user interface presented in the mobile app, as well as the values entered by the user. When the request is received, the first step is to deserialize this XML. The WHSMobileAppServiceXMLTranslator class converts the XML into a container, which contains both the control information, as well as session information. Processes the data from the user (delegated to the WHSRFControlData class, but some processes implement specific logic by overriding the processControl() method). Builds the container representing the new user interface (typically in a build…() method). The container is then returned to the translator, which then serializes the XML, and sends it back as a response to the mobile device. 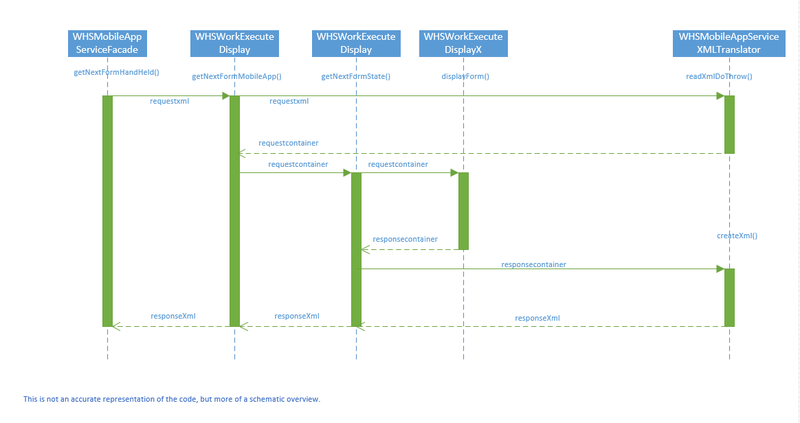 The following sequence diagram shows an overview of the execution flow. Note that the diagram is more of a schematic overview and is not a 1:1 representation of the actual code. The above design offers a very simple framework for building processes used in mobile flows. However, as is evident above, the displayform() methods take over multiple responsibilities. It does delegate them to other methods and classes, but in the absence of concrete class responsibilities, it is done in an inconsistent manner across classes. Also, as the number of supported scenarios grows organically, some of those classes can become quite complex. To make matters more interesting, some of those classes/methods are overridden and re-used in multiple modes. The result is extremely long methods with high cyclomatic complexity. These have posed maintenance issues in the past. Fixing bugs in these methods has been risky and regression prone. For example, the processWorkLine() method in the WhsWorkExecuteDisplay class is referred from multiple processes (basically, anywhere where work execution is performed). To make these extensible, one of the options would be to split the displayForm methods into smaller methods and introduce extensibility points. However, because of the scenario matrix, it would be challenging for partners to write extensions and validate against regressions. Not only that, because of the lack of structured responsibility distribution noted above, the code would keep growing in unpredictable ways over time, posing challenges in building quality extensions. As a result, the redesign is the sustainable option, with a goal to have clearly defined classes having independent responsibilities. A class should have one responsibility, one reason to change, and one reason to be extended. In the redesigned framework, the core strategy revolves around two principles: divide the execution flow into individual components with well-defined responsibilities and have well-defined extension points in each of the components. The name for the new framework is “ProcessGuide”. This is because the aim of these classes is to guide a user through a business process (as opposed to the rich client which is a form-based experiences where the user has more flexibility in how they interact with the data or in which order they perform tasks). One notable detail is the deliberate omission of the “WHS” prefix. While the mobile processes were initially introduced for warehousing, subsequently they have transcended boundaries to support various production and inventory management processes. As a result, the warehouse reference was excluded in the name of the framework. To identify the components, the first step is to look at the Production Start process (WhsWorkExecuteDisplayProdStart class). Here is a schematic of the process. A controller to stitch through the entire business process. A step responsible for execution of a step in the process. A data processor for processing the data in a step. A page builder responsible for building the user interface for a step. A navigation agent responsible for step transition. A class responsible for executing the business process. ProcessGuideController - This class orchestrates the overall execution of the business process. It defines the factories that instantiate the step and the navigation agent, which subsequently constitute the process execution, as well as the clean-up logic for cancellation or exiting the process. ProcessGuideStep - This class represents one single step in the business process. This class contains a definition of the factories that instantiate a page builder, actions, and data processors and is responsible for invoking them in the correct sequence. ProcessGuideNavigationAgent - This class is responsible for navigation between the steps. When a step is completed, the navigation agent is responsible for defining the next step and passes any parameters that the previous step may need to communicate to the next one. ProcessGuidePageBuilder - This class is responsible for instantiating the user interface. ProcessGuideAction - This class represents an action, shown as a button to the user. ProcessGuideDataProcessor - This class is responsible for processing the user entered data in a field. The starting point of the execution flow remains unchanged. So, the request still arrives through the same endpoints, followed by deserializing the XML into the container. This container is then passed to getNextFormState(). ProcessGuideSessionState – This contains the session state information – mode, pass, controller, and step being executed, and so on. ProcessGuidePage – This contains a strongly-typed representation of the user interface metadata. ProcessGuideRequest – This contains the above two as members and is a strongly-typed representation of the request received from the mobile device. These classes are created using the container information (both state and user entered control data). This provides a type-safe way to access and manipulate the values. Compared to repeated access of the container during the process, this provides benefit both in terms of readability and performance. The session state information is used to instantiate the correct ProcessGuideController class. Once instantiated, the createResponse() method in the ProcessGuideController class is invoked. This method is the entry point to the process guide logic, and after execution, comes back with the response (represented in the ProcessGuideResponse class). The response is then converted back to the container and handed back to the legacy logic, which then serializes it to the XML and sends the response back to the mobile device. Next, the controller needs to find the next step to execute. If this is the start of a new process, the controller will call initialStep() to get the first step in the process. After that, it would call execute() method in the ProcessGuideStep. This method would then instantiate a ProcessGuidePageBuilder class and call buildPage(), which would return with a ProcessGuidePage object, which is a virtual representation of the user interface to be presented to the user. The step would then send the result back to the controller, which would then save the current session state and then return the result back to getNextFormState() in the form of the ProcessGuideResponse class. Thereafter, the response is converted back to the container, and subsequently serializes to XML and sends back the response to the mobile device. The following sequence diagram explains this control flow. Note that this is the most common control flow, simplified for explaining the design. When the user takes an action on the mobile device by clicking a button (or scanning a value – which typically triggers the default action) – the request arrives at the createResponse() method in the ProcessGuideController class through the same route. This time, however, the controller knows from the session state information which step the user is in. Accordingly, it instantiates the appropriate ProcessGuideStep class and invokes the execute method. The ProcessGuideStep, in turn, reads the action name invoked by the user and then instantiates the appropriate ProcessGuideAction class and calls execute(). The ProcessGuideAction class is responsible for executing the specific action, however there are two notable exceptions. The first one is the ProcessGuideOKAction class. This action implies that the user wants to confirm and move forward in the process. In accordance to that – this method actually does a callback to the ProcessGuideStep class, which means that the step invokes processData() in ProcessGuideDataProcessor. This processes the data that the user has entered, and then updates the state of the step and sends the result back to the controller. Depending on the outcome of the processor, the step invokes the page builder to build the appropriate user interface or sets the status of the step as completed. This is reflected in the top half of the sequence diagram below. The other exception is the cancellation action, implemented in the ProcessGuideCancelResetProcessAction and ProcessGuideCancelExitProcessAction classes. These actions represent an intent to cancel the process and go back to either the start of the process or exit the process altogether. Similar to the OK action, these actions also perform a callback to the step, which signals the intent to the ProcessGuideController. The controller then performs the necessary cleanup of state variables and either moves control to the initial step in the process or terminates the process altogether. After the step is completed, if the status of the step is set to Completed, then the controller instantiates the ProcessGuideNavigationAgent, which returns the name of the next step. The controller then instantiates this step and invokes the execute() method – and the cycle continues. Most commonly, the new step invokes the corresponding ProcessGuidePageBuilder to build the user interface for the next screen to be presented to the user, which is then sent back. This flow is depicted in the lower half of the sequence diagram below. The best way to explain the control flow is by using an example that exists in the application – the Production Start process. Let’s start by understanding the process flow. In the first step, the user is prompted for production order ID. When the user enters the production order ID, the order number is validated. Some of the validations that are run are based on whether the order is in the same warehouse as the user is signed in to, and the status of the order. If the validation fails, the user is shown an error message. If the validation succeeds, then the user is shown details of the production order and item. The user can either cancel to go back to the start of the process or click OK to confirm. In the latter case, the production order is set to Started status, the corresponding journals are posted, the control moves back to the first step, and the “Work Completed” message is shown to the user. 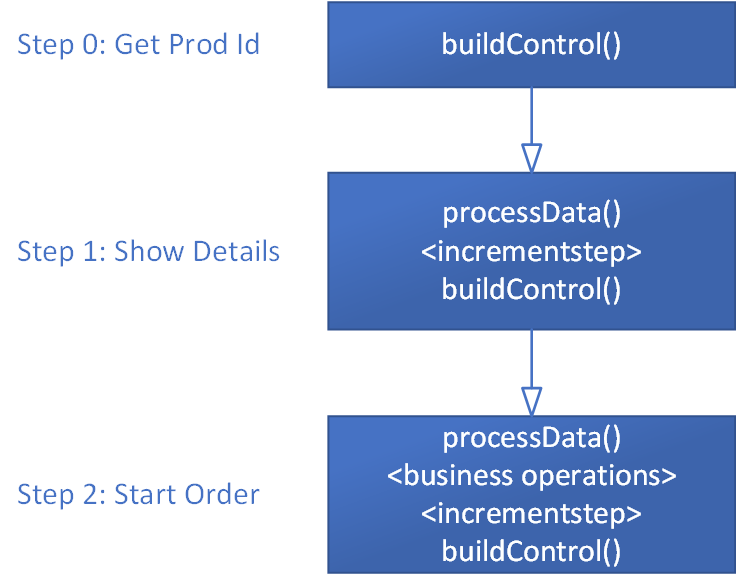 The first step in building the business process is creating the controller class, extending from the ProcessGuideController abstract class which implements the default behaviors of a controller. The new class name is ProdProcessGuideProductionStartController and decorated with the WHSWorkExecuteMode value of StartProdOrder. The same SysExtension based instantiation that was used in the WHSWorkExecuteDisplay classes is used, which helps instantiate the controller when the user executes a menu item for this mode. The naming pattern of the class is <FunctionalArea>ProcessGuide<Businessprocessname>Controller. This is the pattern that is used for the controller classes and to extend to other classes. Next, to define the first step you create the ProdProcessGuidePromptProductionIdStep class, extending from ProcessGuideStep. Decorate the ProdProcessGuidePromptProductionIdStep class with a ProcessGuideStepName attribute. In the controller class, implement the abstract method initialStepName() to return the step name. The value in the ProcessGuideStepName attribute does not need to exactly match the class name as shown above. However, implementing this allows for uniformity and type-safety around cross-references when using the class. Using this naming convention is recommended. Create a new factory class inheriting from ProcessGuidStepAbstractFactory. Optionally, create a new parameter class implementing the ProcessGuideIStepCreationParameters interface, containing the parameters the factory would need. In your controller class, override the stepFactory() and stepCreationParameters() methods to return the above factory and parameters. The next step is to implement the functionality of the ProdProcessGuidePromptProductionIdStep class. You need to implement the logic for building the user interface, processing the user-entered data, and determining when the step is complete. The user interface is built using a class inheriting from the ProcessGuidePageBuilder abstract class. For this step, name the class to represent what it does – ProdProcessGuidePromptProductionIdPageBuilder. The instantiation mechanism of the class is similar to how the step was instantiated from the controller. Decorate the ProdProcessGuidePromptProductionIdPageBuilder class with a ProcessGuidePageBuilderName attribute. In the ProdProcessGuidePromptProductionIdStep class, implement the abstract method pageBuilderName() to return this name. Create a new factory class inheriting from ProcessGuidePageBuilderAbstractFactory. Optionally, create a new parameter class implementing the ProcessGuideIPageBuilderCreationParameters interface, containing the parameters the factory would need. In your step class, override the pageBuilderFactory() and pageBuilderCreationParameters() methods to return the above factory and parameters. To implement the user interface you need a page with one text box to enter the production order ID, plus an OK button and a Cancel button. The Cancel button should exit the process. Use the addDataControls() method to add the text box. Use the addActionControls() method to add the OK and Cancel buttons. This adds the data controls, followed by the buttons. However, if you want to build a screen with interspersed data controls and buttons, you can override the addControls() method instead for flexibility. An additional scenario to consider is how to rebuild the page in case of validation failures, for example if the user enters an incorrect production order ID. The ProcessGuidePageBuilder base class implements the default behavior, which rebuilds the user interface, clears out the scanned value, and adds the error control with the error message. Because this is the default behavior that you want to use, you do not need to add any code for handling errors. If you want to implement custom UI behavior for error situations, you can override one or more of the methods rebuildFromRequestPage(), isErrorState(), and reuseRequestPageOnError(). The processing of the data is done in the ProcessGuideDataProcessorDefault class, which in turn invokes the legacy WhsRfControlData class. No changes are needed to this default behavior, and WhsRfControlData already has logic for validating the ProdId field, so you do not need to write any logic for handling this. In case of required extensions for the validation logic, consider using the WhsControl based extension mechanism. When the validation is successful, it is time to mark the step as completed. This is done in the base class, however, you need to implement the condition to determine the step completion. The following overridden method does that. In the second step in the process, the user is shown a screen with details about the order. 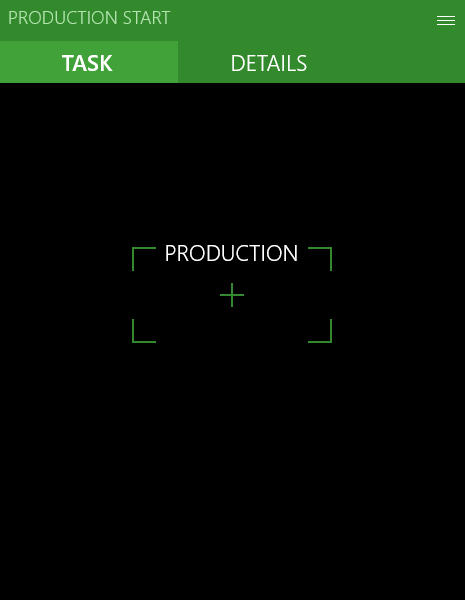 The user can either click the OK button to confirm the start of the production order, or click Cancel to go back to the start of the process. For this example, name the step ProdProcessGuideConfirmProductionOrderStep and the page builder class ProdProcessGuideConfirmProductionOrderPageBuilder. 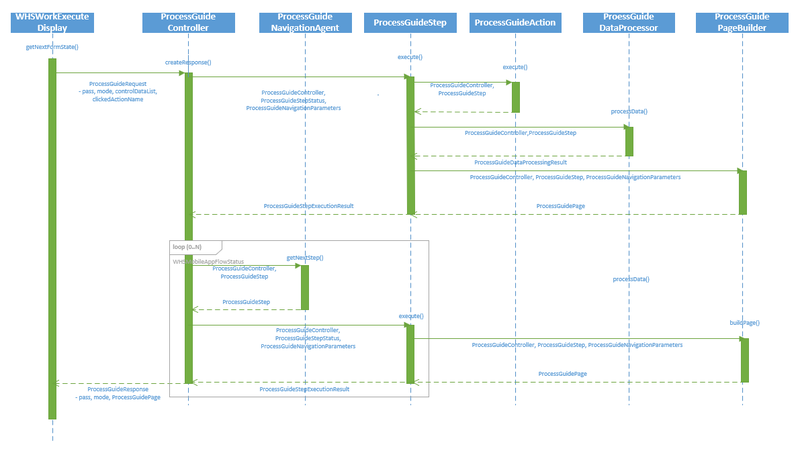 The ProdProcessGuideConfirmProductionOrderStep class looks like the following. Because the user does not enter any values here, you do not need to override the isComplete() method. The step is complete when the user clicks OK. The page builder class overrides the addDataControls() method to add three labels. The first label shows the production order ID, the second contains item information (such as item ID, dimensions, or description) and the third contains the quantity and unit of measure. The addActionControls() is then overridden to add 2 buttons – the OK button, and the Cancel button to cancel the process and go back to the start of the process. The third step is where the business logic of starting the production order is executed. This step is somewhat different from the previous steps, in that, this step does not have a user interface. This step gets executed silently when the user clicks OK in the previous step. The ProcessGuideStepWithoutPrompt abstract class implements the default behavior for such steps. The current step, therefore, should extend the ProcessGuideStepWithoutPrompt class and override the doExecute() method. The following code example shows the class and the doExecute() method implementation. The method simply retrieves the order ID and user ID from the session state and invokes the method to start this production order. In case of an exception, the framework exception handling logic ensures that the process is rolled back to the previous step. The invoke to addProcessCompletionMessage() adds the “Work completed” message to the navigation parameters. The next step (assuming it has a user interface) will display this message. The base classes handle this logic, and no specific code needs to be added to the process classes to achieve this behavior. The ProcessGuideController base class instantiates the ProcessGuideNavigationAgentDefault class, which relies on a pre-defined navigation route, which is a simple map of source and destination steps. For the production start scenario, because there is no conditional branching, this implementation would suffice. Therefore, you only need to override the initializeNavigationRoute() method to define the navigation route. 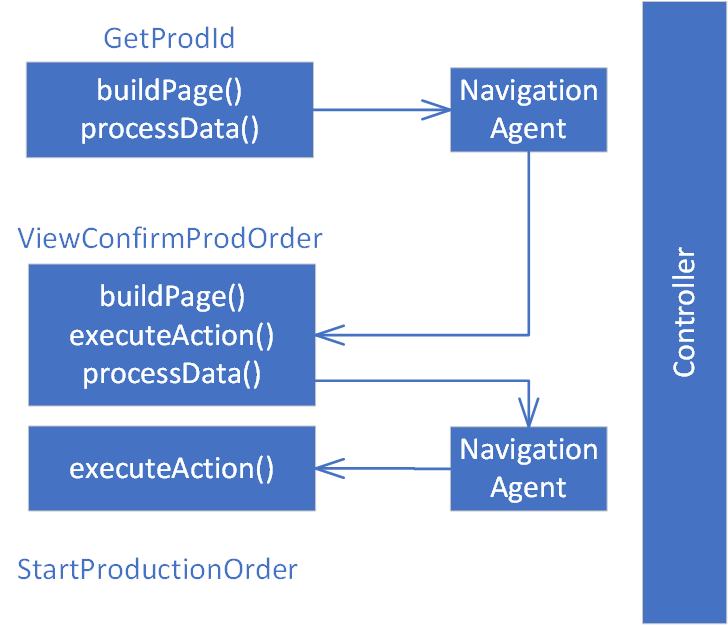 Implement specific navigation agents inherited from the ProcessGuideNavigationAgent class. Implement the specific navigation agent factory inherited from the ProcessGuideNavigationAgentAbstractFactory class, containing logic to instantiate the correct navigation agent based on current step, session state, user action, or other logic. Optionally, override navigationAgentCreationParameters() in the controller class to pass suitable parameters. Override navigationAgentFactory() in the controller to instantiate the navigation agent factory created above. Action classes represent user actions, so this example uses the OK action to show how the actions are created. label(), which returns the label to be displayed in a button control tied to this action. doExecute(), which performs the action. As mentioned earlier, the OK button simply performs a callback to the step. However, other actions might have more complex logic here. The actions are instantiated using SysExtension framework based on the ProcessGuideActionName attribute. Similar to the instantiation of page builders, the step class implements the default action factory, and it is possible to override that. The page builder adds a button control like this. In doing so, it asks the step to create an action class for the passed name and ties that action to the button. Override initialStepName() to provide the name of the first step. Override initializeNavigationRoute() to construct the navigation map. Override isComplete() to specify when the step is considered complete. Override pageBuilderName() to specify the page builder to be used. Override addDataControls() to add the Prod ID textbox. Override addActionControls() to add the OK and Cancel buttons. Override addDataControls() to add the order, item, and quantity information labels. The generateItemInfoForProdId() method, which is used for generating the item information labels, is excluded from this topic. This method queries a few tables to get item ID, description, and dimensions. If you want a better understanding of generateItemInfoForProdId(), look at the source code. Override doExecute() to perform the production start process and add the process completion message. Note that a lot of the common patterns (regeneration of UI on error, setting process completion message, OK and Cancel behavior) have been moved to the framework – thus saving the application developer from writing boilerplate code that is both error prone, and has a risk of inconsistent behavior across processes. Where the scenario needs to deviate from the common path, though, the application developer is provided the option of overriding suitable methods – but then that is an intentional deviation that is both explicit and trackable. So far, this topic has highlighted how to build a new process using the ProcessGuide framework. In this final section, you will find some examples of how this business process can be extended. Child of ProcessGuideController class for the process. Extend the initializeNavigationRoute() method in the controller class, and invoke addFollowingStep() in the ProcessGuideNavigationRoute class. Create a new child class of ProcessGuideNavigationAgent that returns the desired step name. Create a new class deriving from ProcessGuideNavigationAgentFactory that conditionally returns the navigation agent created above. Extend the navigationAgentFactory() method in the controller class to return the factory created above. Child of ProdProcessGuidePageBuilder for the step. Extend the addDataControls() method and add the additional control. Create a new child class of ProdProcessGuidePageBuilder class, and implement the desired user interface. Extend the pageBuildeName() method in the step class to return the ProcessGuidePageBuilderNameAttribute for the class created above. Extend the isComplete() method to build the additional logic.